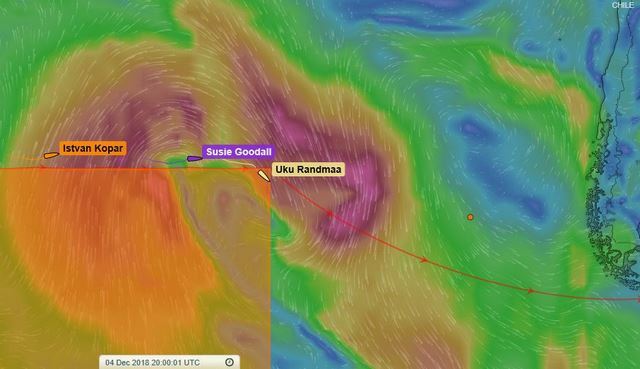 Uku Randmaa Golden Globe Race 2018 and Susie Goodall Racing are about to be enveloped in a growing storm that appears to be unstable and hard to define. one thing for sure is that they will have some challenging big wind and sea condition all changing directions over the next 36hrs . Both have been alerted and the No go zone has been opened if they need to stay safe till this passes. Istvan Kopar Solo Circumnavigator is now in a storm that was not expected to get to 55kts as he is experiencing now. It intensified over the past 12 hrs his latest message THIS STORM HAS BECOME A VERY NASTY ONE..it is expected to decrease over the next 8 hours. Tapio Lehtinen Sailing has just another 18hrs to go in tough strong headwinds but it is going to swing!!! Woop Woop for him..he has done an amazing job to be positive enduring a sailors worst nightmare! !...he will be sailing EAST very soon. Captain Coconut Mark Sinclair is becalmed and want to be the true sailor and NOT motor so his family and friends are pacing on the dock waiting. his ETA could be ???? some time soon. Hopefully tomorrow afternoon as no wind or light headwinds still prevail. @Igor is drifting slowly to Albany too! Jean Luc Vandenheede has endured the storm now moving away from him and the forecast is suggesting four days of OK sailing condition to head north and Mark Slats has a reasonable weather window for the next few days as well so there may be no gains for now But it is a long way to the finish at Les Sables d'Olonne Agglomération! UPDATE ! In six hours Susie Goodall Racing will be in the eye of this storm. She will experience a sudden change in sea state and 90 degree wind shift making challenging conditions.. GGR just sent her the following ...Alert 0200UTC 5th Dec. NW wind stop UR in eye 0400UTC SSW 50-65 gale 2 hrs then 24hrs varying storm dropping and increasing dropping etc 30-60kts mainly SW to W. 6mtr confused sea Gd Luck..